NASA launched two sounding rockets almost simultaneously from the Poker Flat Research Range in Alaska at 12:41 a.m. EST (0541 GMT) on March 2. The rockets carried instruments to study the northern lights as part of the Neutral Jets in Auroral Arcs mission. NASA launched three rockets into the aurora borealis Thursday (March 2) to study what happens to Earth's upper atmosphere when it's bombarded with solar wind, or energetic particles that flow from the sun. 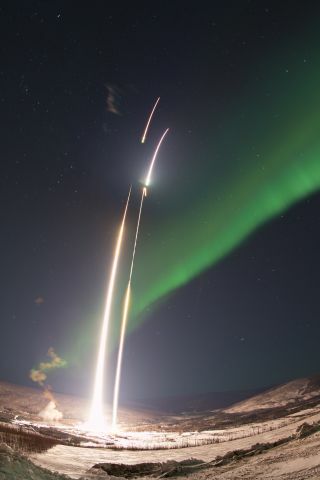 All three Black IX sounding rockets blasted off within a 2-hour time span from the Poker Flat Research Range in Alaska. These were the last three launches of NASA's Poker Flat Sounding Rocket Campaign, which has sent a total of five Black Brant IX sounding rockets soaring into active auroras since January. A NASA Black Brant IX sounding rocket blasted off on Feb. 22 at 5:14 a.m. EST (1014 GMT) from the Poker Flat Research Range in Alaska. The rocket carried an Ionospheric Structuring: In Situ and Ground-based Low Altitude Studies (ISINGLASS) instrument payload examining the structure of an aurora. On Jan. 19, NASA kicked off the campaign by launching the Polar Night Nitric Oxide (PolarNOx) experiment. "The aurora creates nitric oxide, but in the polar night, there is no significant process for destroying the nitric oxide," principal mission investigator Scott Bailey, of Virginia Tech, said in a statement. "We believe it builds up to large concentrations." Because nitric oxide can destroy the ozone, Bailey said, this suspected buildup is concerning to scientists; the purpose of PolarNOx is to measure how much nitric oxide is in the atmosphere and where most of it tends to linger. The last of three sounding rockets aimed at studying auroras blasted off March 2 at 2:50 a.m. EST (0750 GMT) from the Poker Flat Research Range in Alaska. On Feb. 22, a second rocket blasted off, carrying an instrument called Ionospheric Structuring: In Situ and Ground-based Low Altitude Studies (ISINGLASS). This instrument looks at the visible structure of auroras. "The visible light produced in the atmosphere as aurora is the last step of a chain of processes connecting the solar wind to the atmosphere," Kristina Lynch, ISINGLASS principal investigator, said in a statement. "We are seeking to understand what structure in these visible signatures can tell us about the electrodynamics of processes higher up." The fifth and final mission that blasted off Thursday also carried the ISINGLASS instrument. Both rockets that launched almost simultaneously 2 hours before that carried payloads for the Neutral Jets in Auroral Arcs mission, which seeks to explain how Earth's magnetic field creates "jets" in the structure of auroras. Photographer Aaron Priest captured this stunning crown-shaped aurora borealis shining over Maine on Sept.1, 2016. So far, the mission teams have reported that their instruments successfully collected and transmitted data. Now they're working to review that data, with the aim of unveiling some of the mysteries of this beautiful phenomenon in our northern skies. "The ability to successfully launch these [final] three rockets is a testament to the capabilities of the range, science and sounding-rocket teams," Phil Eberspeaker, chief of the Sounding Rockets Program Office, said in a statement. "Great coordination is required to institute the complex countdown required to prepare and launch three rockets in a short period. The team did a fantastic job executing these launches."